An addition and remodel to a home sited on a gently sloping hillside in San Carlos, CA. 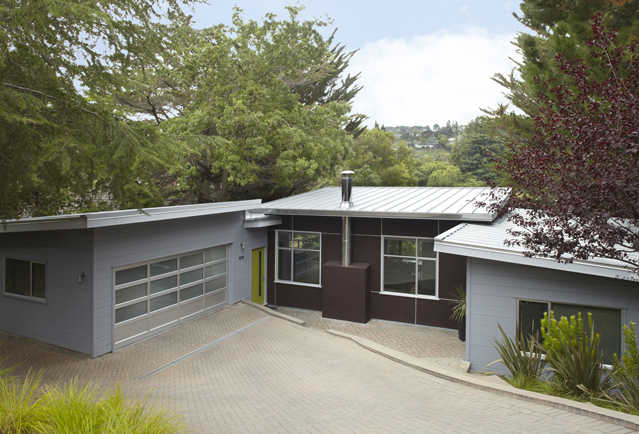 The existing structure, a badly worn post-war ranch style house, was reinvented by substituting new single-slope roof forms in place of the old sagging gables. A new master bedroom suite addition established an ‘H’ plan which delineates two juxtaposed exterior spaces: a public entry court on the street side and a private fire patio in the lower rear yard. Simple materials, spare forms, and interlocking interior spaces define a clean contemporary aesthetic that proved to be surprisingly economical.